Dining in Atlanta entails more than the Southern staples of Atlanta-based Waffle House and Mellow Mushroom. Southerners' palettes are considerably more diverse than some might think. 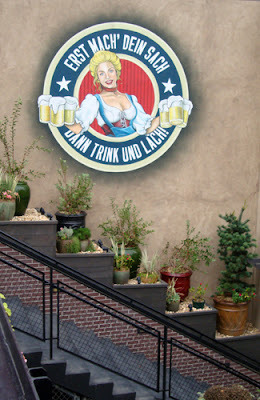 The recently opened Der Biergarten (photo), located adjacent to Georgia Aquarium, features a significant menu of German cuisine and libations (watch the creation of the mural in this video); RA Sushi at 1080 Peachtree is touted as home of the city's best sushi; and Violette Restaurant, on Clairmont Road, offers some of the best French cuisine in town that I've had. But, if an authentic Southern culinary experience is what you're longing for, there's always Gladys Knight's Chicken & Waffles on Peachtree Street.